Last night’s Lacrosse Banquet was lovely. It was held at a hoity-toity country club, and the golf course view from the room was phenomenal. Jim requested that we sit near the door because he has been really sick over the past week (having coughing fits so bad he changes colors!) and wanted an easy escape if he started to hack away. The fifteen-year-old, of course, didn’t want to sit with us (the players all sat together for the most part). So we grabbed spots at the table near the door, and sat alone until the late people came in: because nobody normally chooses the table that is furthest from the action. I, being a social butterfly, was naturally disturbed by the location of our table, but how could I insist that my poor sick husband sit in the middle of the action when he could have a coughing fit “to beat the band” at any moment? Of course, the consequence of sitting furthest away from the microphone and podium meant one other thing: that we would get to go to the buffet last. I was not happy about that either, because I was about ready to eat my own hand off shortly after we arrived. But I got my food after an hour and it was all good in the ‘hood. Presentations were made to the Lacrosse Club Board and others such as the coaches and the coaches’ wives. The coaches spoke, the members of each team (Varsity, Junior Varsity, and Fresh/Soph) were called up one by one as a team and presented with their letter for their jacket (our kid has not yet purchased a letter jacket but since he has a couple of letters now–one for his grades, woot woot–it’s about time for us to figure out how much we’ll help him pay for one). They were also presented with a McDonalds coupon for a free meal (nice), a Chicago Machine t-shirt, a CD containing photos of them during the games (each kid got his own personalized CD containing only photos that he was in! ), and something else really awesome: a DVD on which the parent photographers created a 90-minute photo montage (set to music) of all three teams. Really fantastic. When the JV coach called up all of his boys, he said really nice things about each one and what their strengths were. Then we got a big surprise: our boy won the Most Improved JV Player award! Can I get another Woot Woot? Very exciting! All in all, I can’t believe Lacrosse is really over for the season. Although I don’t miss being run around ragged with the heavy-duty schedule, I miss watching the games. But…there’s always next year! Wow, most improved! Impressive! I’m guessing those lessons must have paid off after all! Anyway, very cool! Lacrosse is an awesome sport. Hey Melis! Our good family friend, Bud Petit played at U of V, and just got on with the Chicago Machine LaCrosse team… does your son follow it that much that he’d know of him? Way to go Dylan!! Way to go Jim and Melisa! Your mom and I are so proud of you guys! We can’t get over how fast Dylan has grown into the fantastic young man we always knew he would be due to having parents like you and Jim! Kudos to all of you! 🙂 Mom and I are walking tall tonight! If you need help in purchasing Dylan’s letter jacket, call me!! That’s a great investment for a winner! OK, what first, that your dad left you a comment (and a cute one at that?!) or the MVP award or the fact that someone put together a huge slideshow of the season? Sounds like a fantastic night for sure! Glad you didn’t eat your arm off and DH didn’t have a coughing fit. I am going to assume the last 2 things because you didn’t mention them. OH yeah… and they get a letter jacket for academics? That is new to me! Melissa: Yep, I think so. Although I am certain that what made the biggest difference was him just actually PLAYING and having practice everyday. Good thing too, because we can’t afford to put him through a bunch of workshops this year: his plan is to work out really hard (running and all) all summer long. The Varsity coach is also running 3 weeks of practice (2X per week) for a bunch of boys that are going away for a Lacrosse camp, and he’s opening it up to ALL current players. Oh, and it’s free. Woot woot! Huckdoll: Hmm. I don’t know. American vs. Canadian nets? LOL No idea. Sue: Correct! No coughing fit (IN the room…he did have to leave once) and I did indeed survive long enough to get food. And YES! They now give letters for academics…and MUSIC! (band, chorus…) I absolutely love that. In the “olden days” (you know, when you and I were in school), only the jocks got letters. Not anymore! Holy crap, I’m so excited for him. First, our hs is green and gold as was our junior high. I have old green and gold coming out my ears. 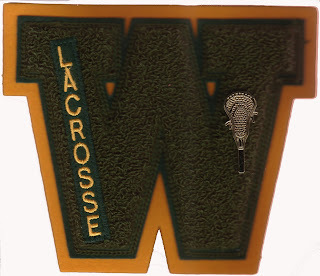 Only varsity get letters here. The jacket and everything cost us over 500 bucks for my older son 3 years ago. He never wears it and I will be stealing it for me one day. Second they give letters for grades? How awesome is that? Great incentive and makes complete sense. Your son is really growing. My 17yo grew 6 inches the summer he was 15 and 3-4 inches last summer/this year. Michelle: Ugh! February 2009 will be tryouts! Janice: I think the jackets here are more like $175. Still alot! I’m hoping that they don’t give them to girls like the “olden days”. Kat: Stop it! You’re too sweet. You know I don’t write about this stuff for the compliments! Seems like we just cheering him on for getting on the team, and now the season’s over! Many congrats on the letter, and the Most Improved! Way to go!